So, you're tired of that last fad you’re still wearing in your hair but not sure how to go about getting rid of it? do you feel stuck with faded color? Below is an email we received from someone who had never been to our salon, but was looking for advice on how to go about correcting her hair color. It inspired me to do a story on it, as I knew it was not going to be an easy fix. I also knew that she wasn’t alone. I see so many people walking around with remnants of faded out fantasy colors, obviously not interested in maintaining the look. They may simply be unsure how to go about getting rid of it and also afraid of the time and cost involved. We asked her if we could cover her story and she graciously agreed. Our model told us how she searched YouTube looking for a DIY solution to her problem, but all of them recommended using bleach to get rid of it. She was very apprehensive about that, so wisely, she decided to contact a professional. Fantasy colors are not made in the same molecular structure as permanent hair color and bleaching them could cause the color to be pushed further in to the cortex of the hair. Someone, who does not understand how hair color works, could destroy their hair with bleach while trying to get these colors out on their own. This results in what we like to refer to as a “chemical haircut”. The following is a journal of the steps we took to recreate her look. The first step in restoring our models hair was to do a thorough consultation. This included a test strand to ensure that her hair could both withstand the recommended processes and that the pigment in her hair could be removed with the specialized product we have to do the job. 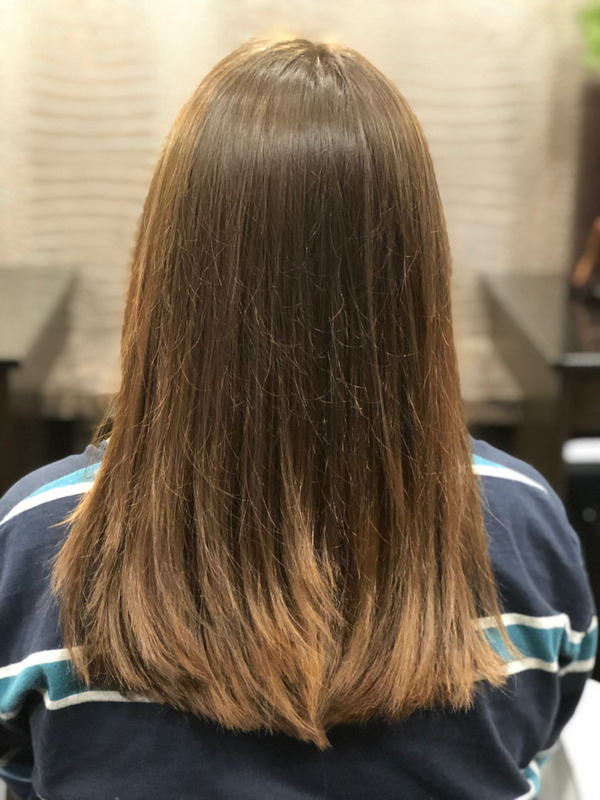 We also had one of our stylists give her a very healthy trim after a decision was made regarding the most flattering length for her new look. Since we knew it was going to be a long day, we asked our model to come back the following week to start the color removing process and be prepared to spend the day with us. The fantasy color was removed effectively according to the test strand done the week prior. Next, a pre-toner was applied to even out the tone along the entire hair shaft to mimic what her natural hair would look like without the bleached ends. After the toner, her ends were tipped and the rest of her hair was highlighted. She was finished off with a shadow root and glaze. 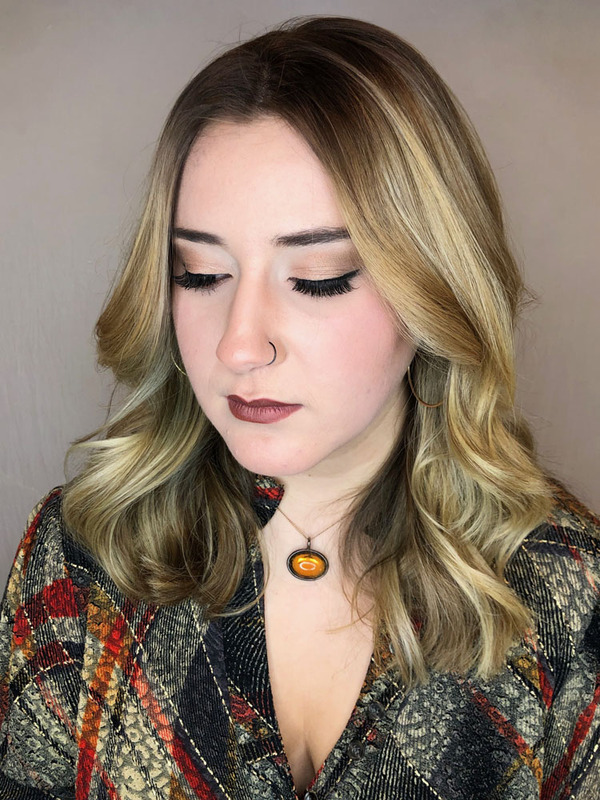 The integrity of her hair was still fully intact, so it was agreed that she could go even lighter with another round of highlights done with a balayage technique to add another dimension of lightness but still maintain a soft, lived in look. We rescheduled her for the following week. A week later, our model came back for her final leg of her color correction. Her hair was painted by hand (balayage) allowing the colorist to place the highlights according to where the hair would live. After processing, another shadow root and final glaze was applied. She was then styled out and we added a little makeup to compliment her new look. As you can see, this makeover took a total of 14 hours and was not inexpensive. It was spread out over 3 segments to allow the hair (and our model ) to rest. Thanks to social media, there has never been a faster rate of turnover for fads that come and go when it comes to hair. Choosing a professional to consult and work with will allow one to understand the realistic time, maintenance, and cost involved. They should also be able to maintain the integrity of their hair while moving through these ever changing trends. When looking for a color correction service, always take the time to have a thorough consultation and be patient. Spreading the service out over a few appointments will give your hair the rest it needs and ensure much better long term results when it comes to the health of your hair. Leaving Mancuso Salon, Just absolutely gorgeous! Thank you for contacting us, someone will get back to you shortly, during business hours.